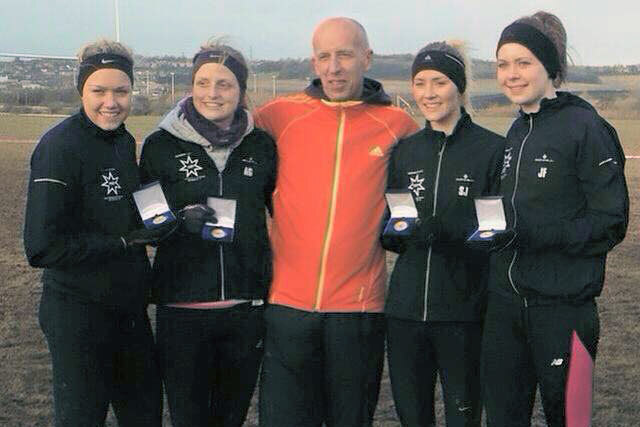 Rotherham Ladies took the North of England title yesterday at Pontefract with emphatic style, consigning last years disappointment to history and making good the promise of Octobers relay gold. Nigel Brookes had the pleasure of seeing his elite squad led home by Samantha Johnson (14th 31:06) with Robyn Lanceley (20th 31:37), Annabelle Grady (21st 31:40) and Jess Fawcett (28th 32:01) the scoring 4. With Steph Burns (30th 32:11) and Alina Stepanchuk (46th 33:15), unlucky in a way to be out of the scoring positions, so so close, a check of the final scores reveals any four of them would have won the title from Liverpool, Leeds and Wakefield. Great squad racing. Great performances too from veterans Janet Hindley (138th 37:42 327) and Philippa James (198th 40:38 328) both of whom are racing formidably well.